During the investigation investigators were able to identify 23 year-old, Palm Desert resident, Carl James Dial Jr., as a suspect involved with this incident. Dial was located and arrested in the 77-700 block of Country Club Drive, in the city of Palm Desert. 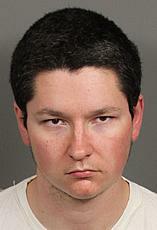 Dial was booked into the Riverside County Jail, located in the city of Indio for arson, hate crime, and burglary. This is an active and ongoing investigation and there is no further information available at this time. On Friday, December 11, 2015, at approximately 12:11 PM, officers from the Coachella Police Department received a call regarding a possible arson at the Islamic Society of Coachella Valley located on the 84-600 block of Avenue 49, in the city of Coachella. Officers arrived within minutes along with Cal-Fire/Riverside County. Cal-Fire was able to quickly contain the fire and it was determined that no one was injured. The Riverside County Sheriff's Department/Coachella Police Department believed this was an intentional act potentially resulting in a hate crime, and utilized all available resources in an attempt to identify and locate the suspect. A person of interest was quickly identified and was subsequently located and detained pending further investigation. This is an active and ongoing investigation, and additional updates will be provided as they become available. The Riverside County Sheriff’s Department/Coachella Police Department, Bureau of Alcohol, Tobacco, Firearms, and Explosives, and Cal-Fire continue to actively investigate this incident. Anyone having information on this incident is urged to contact Investigator Butvidas at (760) 863-8990. Those wishing to remain anonymous can call (760) 341-STOP.